Being new in my faith, I can’t say as I always “get” what God is trying to tell me. I can read His Word and listen to Worship music, tap my feet and sing till someone tells me to stop because I’m told, someone else is on the radio for a reason. I can go out into the world, smile at people and say a friendly hello, come home and plop back into my comfortable life. Those are all very good things, but there’s something that God didn’t see from me. So, what started out as a subtle Fatherly nudge, over the course of a few months, suddenly became my life interrupted. For years I’ve lived my life day by day in a state of what I would call, dutiful. I know what it means to be a dutiful child, a dutiful mother, a dutiful friend, and well, you get the picture. But there was no real joy in all of this duty. Somewhere along the road of life and all it entails, I can say I truly lost my joy. I love to help people, and you would think that would bring me great joy. But, it didn’t. I love to give, and you would think that would bring me great joy. But, it didn’t. I love to make people laugh, and you would think that would bring me great joy. But, it didn’t. I love to receive (just keeping it real), and you would think that would bring me great joy. But it didn’t. I asked Christ to come into my life and I got baptized and you would think that would bring me great joy. But, it didn’t. Now don’t get me wrong, best decision of my life was to give my life over to the Lord, but that didn’t mean I took a magic pill and I was instantly transformed. Took me years to get to where I am, and I gave God a lot to transform. All around me now are Biblical verses and messages of joy, and love, and joy, and love, and joy and love; have been for quite some time actually. This is where God’s nudges have turned into…umm, hello, will you let Me not just talk, but will you listen and obey? Of course God, but, I’m still not sure what you mean, I’m doing what you’re telling me. I’m loving on people and I’ve got my smile on, so why the same messages? Did you just hear God sigh? I think He may have just sighed. Deep down, way deep down, there was this child, who never got to be a child. Life became very serious, very early on. Life was chaotic, emotionally and mentally destructive and painful. In order to survive, she shut herself down and started to live life dutifully. Everything was done out of this sense of duty instead of joyfully. So it should come as no real surprise for her to understand that God didn’t want this for her…God didn’t want this for me. I took joy and shoved it under the weight of many blankets and I carried out my life dutifully. In doing so, I left myself wide open to all kinds of spiritual warfare. I needed my life interrupted so I could get my joy back. But first, I needed to understand a little bit more about joy. In all of my Bible teachings no where have I read that life is meant to be lived dutifully. In my pea brain, this is how I got it worked out. First off, I had to understand this is not a circumstantial emotion. 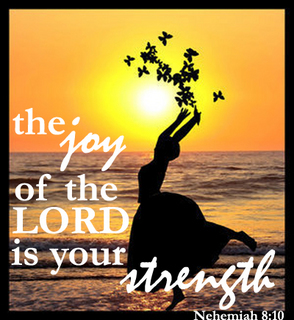 Regardless of our circumstances we are to do everything with joy. Roll my eyes, yea, blah, blah, blah. No disrespect meant here. My structured logical brain got it. My emotional brain was still saying….huh? Okay, so let’s try it from this perspective. If I don’t have joy knowing God is in control and that He works everything out for my good, then when life beats me up, what will happen? I’ll lose my joy, feel defeated and now the enemy can come creepy crawling in and fill my head with lies. That’s why God says to “rejoice” always, not sometimes, not just when I feel like it, but always. If I’m busy re-joy-cing, no matter the circumstance, the enemy can’t come in and turn me into a dutiful, depressed, the life has been sucked out of me zombie. Joy doesn’t have to be complicated. Simply put, I have joy because I have God. So that’s where they joy comes from, it’s a gift from God. He gives it, and all I need do is receive it.